With its simple, smooth lines and modern design, this white Wooden Cat Cupboard makes a beautiful addition to every household and provides the ideal space for concealing a litter tray. The swing door has a magnetic close and offers an acceΒ hatch. The edges are rubberised to ensure your cat does not injure itself going in and out. Inside, there is a shelf for storing acceΒories. Its height can be adjusted or it can be removed completely if you want to insert a larger covered litter tray. This Wooden Cat Cupboard offers your cat the perfect place to hide away from the world or retreat to when visitors arrive. It can either be used as a litter tray cupboard or as a snuggle den, as it can be made dark enough to sleep in. This discreet item of furniture is made in Europe and simply needs to be put together. AΒembly instructions, screws and four height-adjustable feet are included in delivery. It makes a stylish acceΒory to every home and offers your cat its own peaceful little haven! Wooden Cat Cupboard at a glance: Cupboard with swing door and acceΒ hatch The ideal location for a cat litter tray (not included) or as a sleeping den Modern design: strong, straight lines with a white shell that fits into every style of decor With height-adjustable shelf: for storing acceΒories Versatile: for litter trays or hooded toilets. 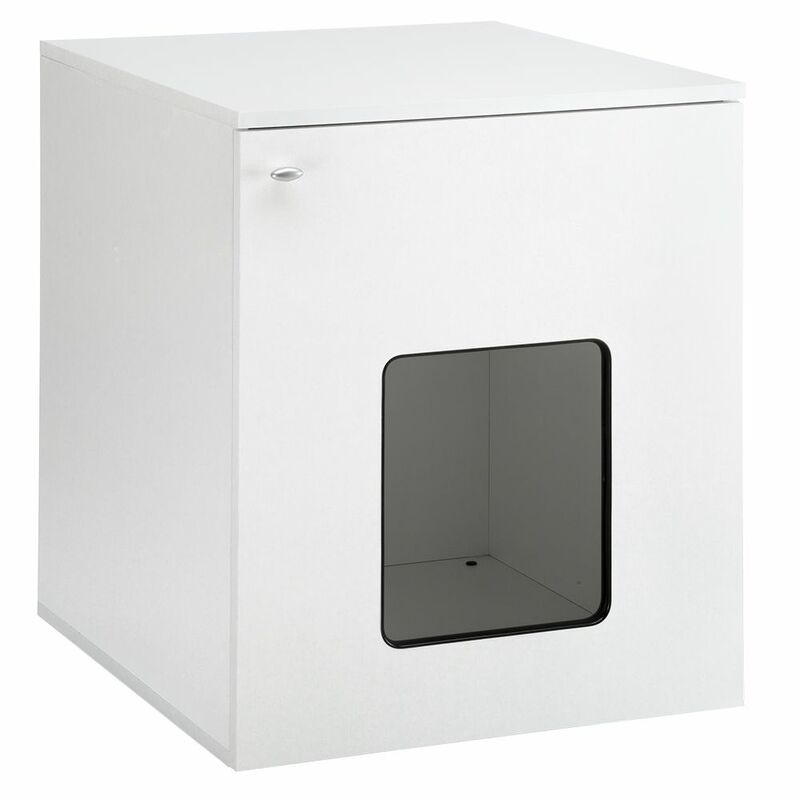 Alternatively, it can be used as a sleeping den or a cosy hideaway Rubberised edges: the entry hole is edged in rubber to prevent injury Door with magnetic close Height-adjustable feet Made in Europe Colour: white Material: coated chipboard Dimensions: Total outer dimensions: 53 x 60 x 65 cm (L x W x H) Total inner dimensions (without shelf): 49. 7 x 56.2 x 60.2 cm (L x W x H) Lower level (with shelf): 49. 7 x 46.2 x 40.4 (min)/50 (max) cm (L x W x H) Upper level (with shelf): 49.7 x 46.2 x 8.6 (min)/18.2 (max) cm (L x W x H) Opening: 23 x 28 cm (W x H) Entry height: 12cm Base height/feet: 1.8cm Please note: Litter tray is not included in delivery. Suitable trays or toilets are available at zooplus.